The Lions Club Constitution requires that 100% of all public monies raised will be channelled back into our community service programs. We do not deduct any administration costs. You can be sure that 100% of your donation will reach those in need. Please use the word "Donation" in the reference for the deposit, and your surname if you don't mind us knowing. Please note that the Lions Club of Doutta Galla Inc is a part of Lions Clubs International (LCI) and is fully accountable as an Australian charitable organisations. It is NOT registered as a tax deductable charity organisation, so unable to provide tax-deduction receipts. Raffles are regularly held at our functions and we are always looking for donations of suitable gifts. Let us know if you would like to offer your assistance with the donation of new, quality goods. 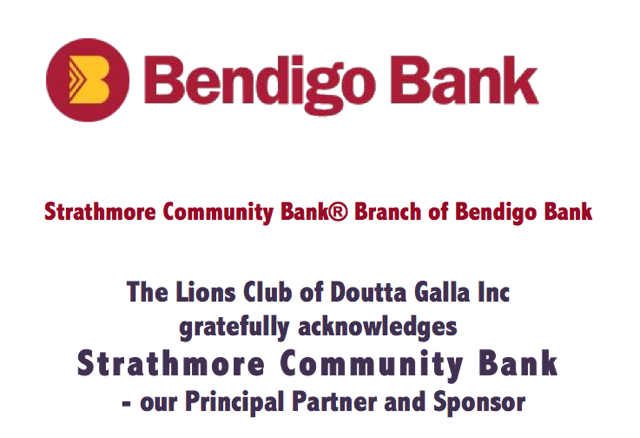 Your generosity towards the Lions Club of Doutta Galla Inc activities will always be much appreciated and if appropriate, can be acknowledged in our news publications and on the website. See our "Contact Us" page for contact details for a number of our members.